The Pisces and Taurus love compatibility in a romantic relationship will typically be happy and wonderful. These two star signs can be found two signs apart in the zodiac. They will have a strong karmic bond. They will both have deep empathy for each other. The Pisces sun sign is idealistic, dreamy, and impressionistic. Taurus zodiac sign is more grounded and rational. They will both like to nurture each other. They will both want a stable and balanced relationship. Pisces and Taurus in love have a lot to give each other. Taurus can give the fish the grounded approach they need to make their dreams a reality. They might not understand their lover’s simple view on life. The fish can give the bull the kindness, gentleness, and sweet sympathy they enjoy in a partner. However, they are not simple. The planets Jupiter and Neptune will rule over Pisces. The planet Venus will rule over Taurus. Jupiter is about luck, It has a male energy. This is the planet that will symbolize philosophy, expansion, and excess. They will add it to the mix. Neptune is about illusions. Venus is about love. Both together will make a beautiful spiritual connection. They will both have a female energy. They will symbolize an idealistic Pisces Taurus relationship together. Pisces and Taurus compatibility will make them both very happy. However, their potent, dreamy relationship might be based on things like dreams, illusions, and fantasy. Pisces and Taurus soul mates will work in a different way in their everyday life. This can be good for their relationship. In this Pisces and Taurus friendship, both will be able to give each other something that they lack on their own. Taurus personality is confident and certain. They will likely feel that they know exactly what they are doing and why they are doing it at all times. At the same time, the Pisces personality will always be unsure. They will be guided by their deepest instincts more than any other zodiac sign. They will be emotional and intuitive. They will help the bull to be more open with their emotions. Taureans can learn how to use their imagination more. They are reliable. They will be able to give the Piscean the solid base and security in the relationship that they need. Pisces Taurus love compatibility will be one with benefits for both of them. The Pisces born is very spiritual. The planet Neptune is mystical and will rule over this sun sign. They are the dreamer of the zodiac. They have the ability to access a rich unconscious stream of knowledge. The Taurus born is the lover of the zodiac. The planet Venus is romantic and seductive and will rule over this star sign. Pisces and Taurus in love will have a beautiful relationship when they meet. Their relationship will be very in touch with their spiritual roots. They will explore the boundaries of mystical things together. They will both be happy with each new discovery they make. This is important to Pisces. Taurus will be more compatible the more they learn about who they are. This will help their overall bond to be stronger. In the Pisces Taurus marriage, both will think that family is important. They will be able to make a creative, open minded, and welcoming home together. They might not be obviously religious. However, their family life will have a kind of spiritual element. If Pisces and Taurus have children, they will raise them with the best of both worlds. The bull will give them grounded and rational advice. The fish will give them emotional, intuitive insight. Pisces Taurus compatibility will be enough that they will typically be able to keep a stable home life. They will easily be able to have a successful relationship. When Pisces and Taurus have children they will be more likely to have a successful marriage. Pisces is the dreamer of the zodiac. Taurus is the lover of the zodiac. They will have a relationship that is beautiful, gentle, and sweet. Pisces and Taurus soul mates will have a strong compatibility. They will seem to have a karmic bond with each other. They will both look for a relationship that is stable and faithful. Pisces and Taurus will be happy to find each other. They will be unlikely to end their relationship. Taurus man or Taurus woman is seductive. Pisces male or Pisces female is emotional. The fish will appreciate and be receptive to the bull in a sexual relationship. They will have a very good atmospheric romantic relationship that is full of magic. Their relationship will be marked by candles, romantic massages, and natural outside locations. The Pisces Taurus sexual relationship in bed will not be the only thing to hold them together. They will be compatible because they will both want to be kind to each other. They will both want to look after each other. Pisces will give Taurus love and affection. The bull will court their lover with skill and charisma. 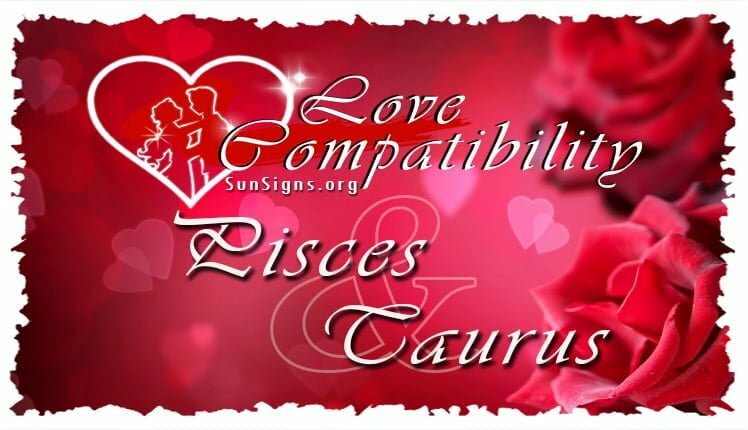 Pisces and Taurus compatibility will not likely have a completely smooth relationship. However it will be the things that make their relationship stronger that might pull them apart. Pisces can have unrealistic expectations of Taurus and other people. They will put their Taurus partner on a pedestal. However, the Taurus male in love or the Taurus female in love might feel restricted if they feel they are under too much pressure. They will bring common sense to the relationship. They might take it to the extreme. This can hurt the magic that the Pisces has. They might find it hard to keep the ethereal beauty that they once had. They will both be able to see the power in their relationship. Pisces dating a Taurus will be compatible enough that they will not likely let petty arguments turn into bigger fights. Pisces Taurus compatibility will not likely end the relationship quickly if they decide to. Neither the fish nor the bull will want to admit the relationship failed. Taurus is stubborn. Pisces will be afraid. Because of this, the relationship might be in denial before they decide to end it. It will be a long time before the Pisces and Taurus breakup. Pisces is a Water sign. They can bring magic to the bull’s’ rational look on life. Taurus is an Earth sign. They can help their lover’s keep their emotions stable. Water and Earth will typically be compatible with each other. They are both physical and tangible entities. They will both need to be careful though. Earth can easily turn to mud. Taurus will not like how Pisces will lack stable emotions. At the same time, Pisces might feel like Taurus does not care about their feelings. Pisces and Taurus coup;lewill typically be able to easily find a way to overlook their differences if they choose to find a way. Pisces is a Mutable sign. They will like having the feeling that they are able to move from one thought to the next on a whim. They will be able to be encouraging and loving. They can teach Taurean that mutability is better than a fixed determination to do things one way and one way only. Taurus is a Fixed sign. They can be stable, stubborn, rational, and focused. They being stubborn can hurt the fish being flexible. They will need to learn to let the fish move easily. The best thing about Pisces Taurus love compatibility in a romantic relationship is that their different emotional natures will complement and balance each other very well. They will both be empathetic and committed to each other. Because of this, they will have a relationship with very strong bonds. The fish and the bull will have a successful relationship.